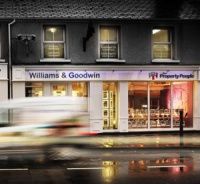 Williams & Goodwin - The Property People hold land and property auctions every 8 weeks throughout the year through their auction department ALL WALES AUCTION. Selling on average 4 out of every 5 properties entered into our auction (85% success rate). Selling more property than any other North Wales based auctioneer. Selling agricultural land & property, commercial business and buildings, residential houses and investment properties and actively marketing properties not only through Williams & Goodwin but also several other independent agents in Wales. "We were kept informed at all stages - very impressive service indeed, especially by Diane, Thank you"